Edraw provides you with lots of organizational chart tools and the greatest flexibility for creating a professional-looking organization charts. Discover why Edraw is an awesome tool to build an organizational chart: Try it FREE. On the Org Chart tab, click the Add Subordinate button. Or select a shape, then click the float button. A new shape will be created as the subordinate of the selected shape. All are quick! On the Org Chart tab, click the Add Colleague button. Or select a shape, then click the float button. To glue a shape as an assistant, you can drag the shape into the float button. When the float button was highlighted red, release the mouse. 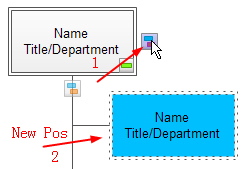 Use Auto Layout tool if you are satisfied with the layout of your org chart, but just want to make it neater and straighten connectors without moving things much. The feature allows the designer to change the layout style freely with one click. You can create the organization chart in separate multiple pages or an a large paper. The page size can extend automatically. Decrease vertical/horizontal distance between all shapes to fit more shapes in a single page. Increase vertical/horizontal distance between all shapes so that the chart will not be too cramped. Select one shape and click move left or right will ship this shape and all its subordinates to left or right respectively (shapes remain perfectly connected and spaced. You can add personnel data for each organizational chart shape. 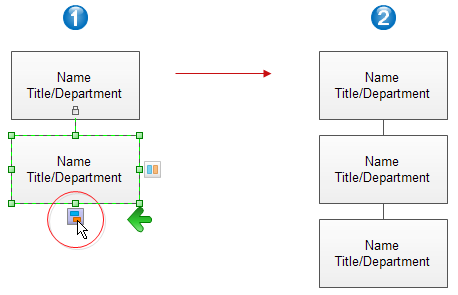 You can use the org chart shapes in the library. But you can easily create your own shapes. Easy to change the design theme and the shape appearance.